Right off the bat, let me state, Brian Bendis is clearly a talented writer and Sara Pichelli is a good artist and visual storyteller. However, I just have to say I can not seem to muster any appreciation for the way that Bendis structures and paces his stories. 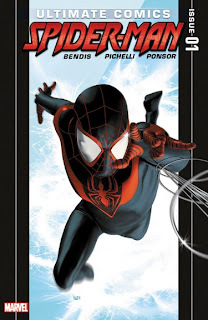 I've noted it before with other comics, but I find every Bendis comic I've read to be a ponderous chore to sit through. So, as a general rule, I tend to avoid them. Here, though, I was hoping that there would be an enthusiasm on his part in introducing his new character to the world that would be infectious and pull me in. There are some positive things about the comic, but overall I was underwhelmed and disappointed. That's it in a nutshell. It ends rather abruptly. Almost like you're watching a tv-show or movie and the power goes out right in the middle of it. It didn't make any structural sense to end it like that and made me immediately go back and count the number of pages because I thought I must have missed something. Nope. 20 pages of story at $3.99 and cut it off right in the middle of the story. Now I understand why they wrapped the comic in plastic – so nobody could thumb through it and, y'know, know what they were buying. The rest of the comic was a 9/11 reprint. The art by Pichelli, is good for what it is. Unfortunately, it's that dull, static, storyboard-style storytelling that Bendis seems to demand of his artists and I think this artist has the ability and the talent to really take this story up a notch in terms of drama and excitement if she wasn't so bound by these thick black rectangular borders that are restraining the action. I'm not hating on it in general. 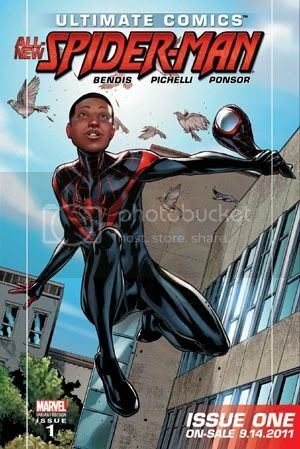 Conceptually, I think the idea of a poor brilliant Brooklyn kid with an uncle who's a thief with a heart of gold, is a good foundation for building a new twist on the Spider-Man legend. I didn't care for how it unfolded. I also thought the manner in which the spider escaped and got to Miles in the first place was especially hackneyed. I would've liked to have seen some better connection to Peter Parker than an Osborn spider that just happened to sneak out of a box because a scientist was distracted. I was imagining something more along the lines of a kid a bit older than Miles in this comic perhaps hacking his way into an online folder where Parker had kept an encrypted file with details about his biological transformation, blood details, formula for webbing, etc. Then watch this kid get to work and break the encryption and yada yada yada, driven by some plot device (family in danger, or something like that) to subject himself to, oh, maybe an untested spider-serum or something. Look for this and other reviews tomorrow @AICN Comics!